Hello all! Welcome to Day 1 of Stamp Highlights! For the next few days we are going to showcase our fabulous Design Team's projects for each stamp set! Today we are looking at Little Cat Agenda. Looks like everyone had oodles of fun with these tiny kitties! 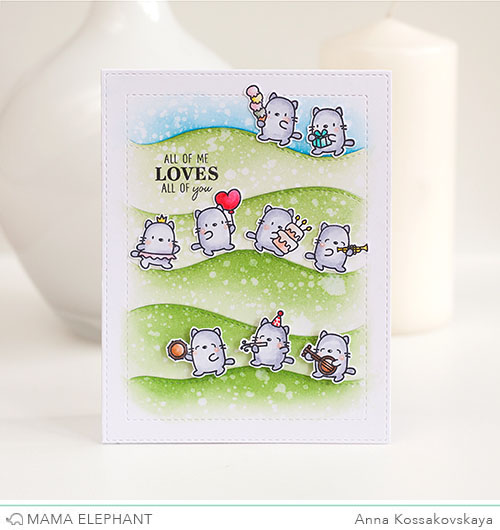 This marching squad of tiny kitties by Anna is absolutely sweet! We love how the little cat is taking a photo of the starry sky! 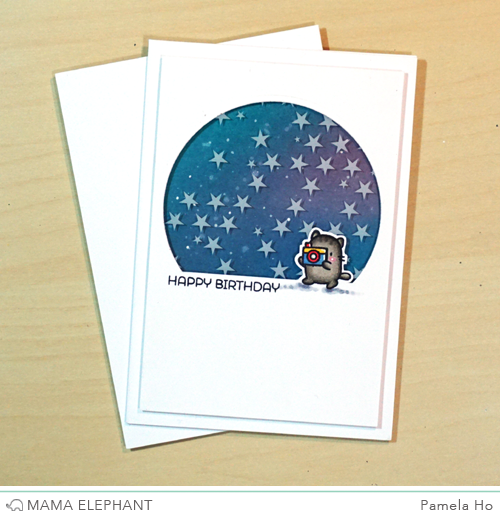 The starry acetate adds such a nice touch to the dreamy background! 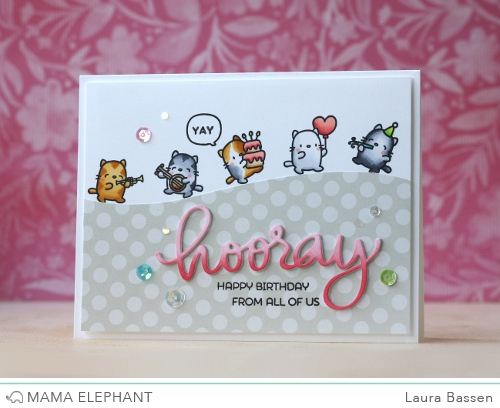 We love Laura's parade of cats! She used the Hooray creative cut along with a coordinating sentiment from Girlfriends. 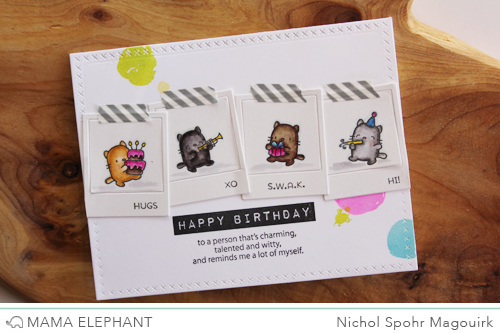 Nichol created little cat polaroids for this darling clean and simple birthday card. 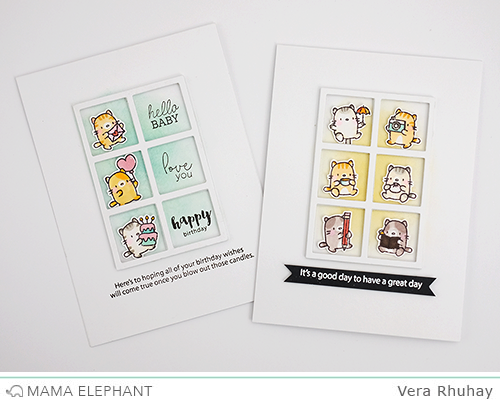 Love how Vera framed the cats using a window frame from Peek a Frame creative cuts. We love how Deasy made a cute friendship scene with the little cats on the blocks. She used the die cuts from Classic Stripe Cover dies to make the blocks and the Friend Script dies for the sentiment. I love these cats! and all the projects are so amazing!! These cards are adorable! The cats just slay me! Are there going to be die cuts for these cats- seeing add they are bigger then the emoji set & little edibles? Oh please! Please ME, make dies for this set!! I love each and every one of these cards. Let their be dies. Wonderful cards! These cats are super sweet! I love all those kitties and those adorable cards! I see you used my favorite color yellow in some of them and you get extra brownie points for that! LOL Can these cats get any cuter? I think not. Great job with all the cards. Love all the cards! Cat Agenda is super adorable and I can't wait to get mine in the mail so I can make some cat cards. So cute! Love these cards so much. Oh gosh these are just the cutest kitties ever!! The little kitties and all the cards are just adorable! Ok. I'll have to wait till after Christmas to get these little cuties. So so so unbelievably cute!! Those cats are the cutest. Please make dies for this set? Pretty please?